10 x grey resin airframe parts, 8 x white metal undercarriage, winch & rotor parts, 1 x PE fret of 42 detail parts, and 3 x decal options. Excellent quality, sensible conversion design, and well-researched. The instructions are adequate, but just a little vague on some small parts locations. Designed for a good quality donor kit and produced to high standards. This conversion should result in an excellent finished product, provided that the builder is accurate when cutting the donor parts and has some references for accurate locating of small parts – Recommended. Other versions used a Wright R-1300-3 Cyclone 7 engine offering 100 hp more power than the earlier R-1340. Eventually the British Leonides Major piston engine was fitted. This gave 750 hp after de-rating from its original 882-hp. Piston radial engines were a limiting factor of early helicopters, and Westland was well aware of the benefits a light and powerful turboshaft engine would offer. The first turbine powered Whirlwind conversion used a General Electric T.58 turbine of 1,050 shp, and flew in 1959. This engine was licence-produced as the Bristol-Siddeley (later Rolls Royce) Gnome. Gnome-powered Whirlwinds enjoyed a significant performance boost. The HAS.9 was a Gnome powered conversion of the HAS.7 which was designed for the anti submarine warfare (ASW) role. The limits of its piston-engine power meant that Whirlwind HAS.7’s had to operate in hunter-killer pairs, with one aircraft carrying dunking sonar and the other a torpedo. 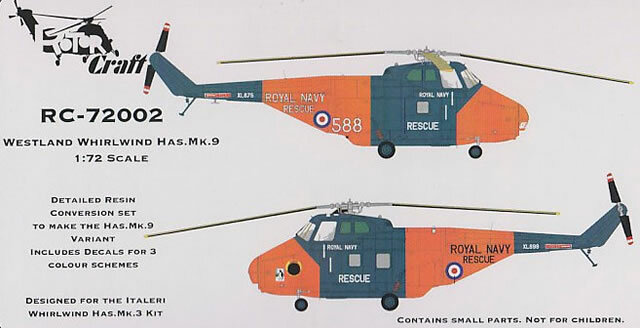 However despite the anti-submarine HAS designation, the HAS.9 was used in the airborne rescue role, although the HAS.7’s under-fuselage torpedo trough was retained (thanks again to the advice I obtained from Scale Rotors members). The HAS.9 entered service in 1996, five years after the much larger Wessex that had taken over the ASW role. It seems the anti-submarine HAS designation was retained for the HAR.9 when used by the RN, but was changed to the more logical HAR.9 in RAF use. The Royal Navy and RAF, as well as several other nations used Whirlwinds. 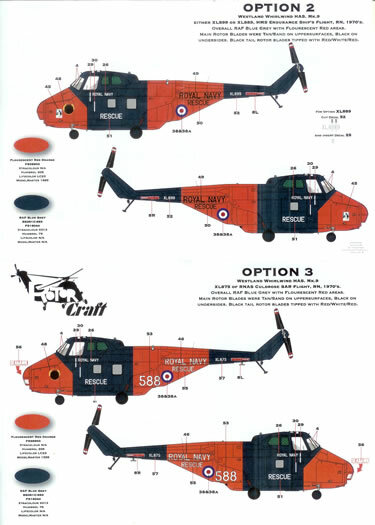 To my knowledge there have been two 1/72 kits of the S-55/Whirlwind helicopter. The first was by Airfix around 1960 who offered a piston-engined Whirlwind. This very basic kit was I believe revised and updated, but remained fairly basic. A much better and quite recent offering by Italeri covered the Sikorsky S-55/HO-5/H-19 with both straight and cranked tail-booms. I’m unaware of previous Gnome engine conversions, but I would be surprised if there have not been some after-market offerings over the years for the Airfix kit. Regardless of this speculation, the release of a high quality conversion by Rotorcraft is very welcome indeed. The set comes in a sturdy small hinged opening box with a one of the decal options featured as box-art. The different media are supplied in separate zip-lock plastic bags, along with clearly printed instructions. Decals plus a painting and markings guide round out the package. BSC & FS colour codes are given, along with Xtracolour & Humbrol paint numbers. The instructions provide scale plans attributed to the late Alan Hall (who’s articles in Airfix Magazine I enjoyed reading as a young modeller in the 1960’s and 70’s). The instructions are helpful in providing a name and number for all parts, which fortunately in the case of the PE fret can be cross-referenced to numbers on the fret. 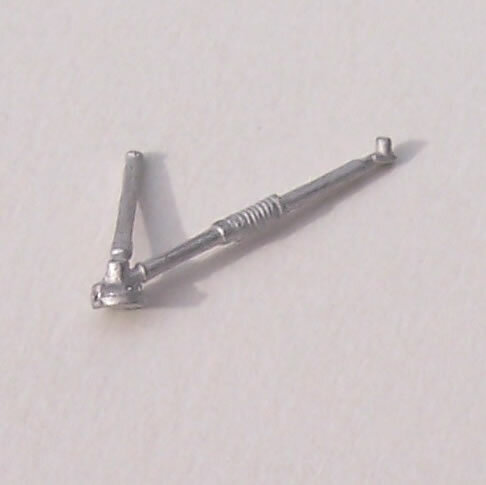 These PE parts are in turn indicated on the scale profiles, but reference to photos of the real thing may be needed in some instances. I feel the instructions don’t cover this aspect well enough for someone unfamiliar with the subject like me. 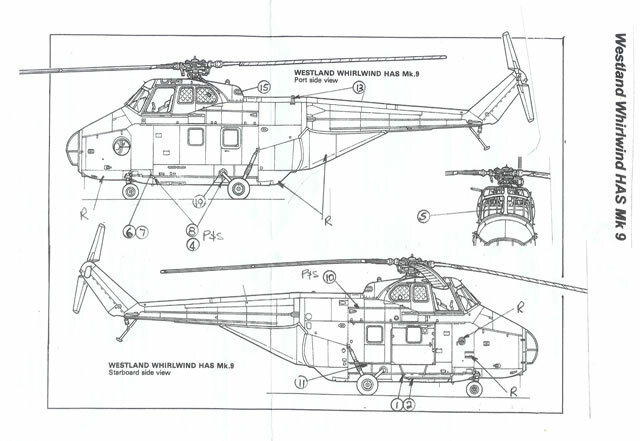 Perhaps Rotorcraft may wish to consider some perspective drawings to assist with indicating locations of similar parts in future releases. In fact it is the instruction’s hand-drawn figures and arrows for PE and small resin part locations that slightly tarnish the set’s professional appearance, and to me seem a little home-spun. For many this will not matter. I think this somewhat casualstyle may be due to aiming products at a community of enthusiasts who are already very knowledgeable about the subject. These builders probably require little or no instruction for a conversion such as this. But as a reviewer familiar with many resin brands, I have to say the instructions do fall a little short of the standards set by some central European brands. This said, I have already found enough photos to cover any ambiguities. 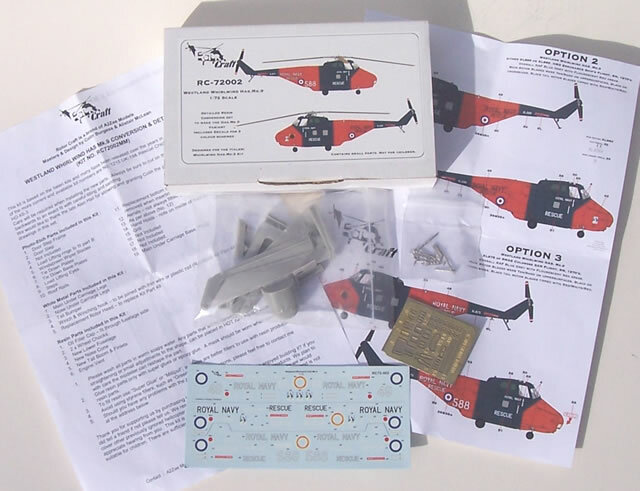 And as I have mentioned, there are some helpful and well-versed helo-experts to be found on various modelling forums if assistance is needed. So please don’t take umbrage at my comments as it’s probably just a British modelling culture thing I’m observing and commenting on. The overriding fact remains that this is a very good conversion set as my following observations attest to. 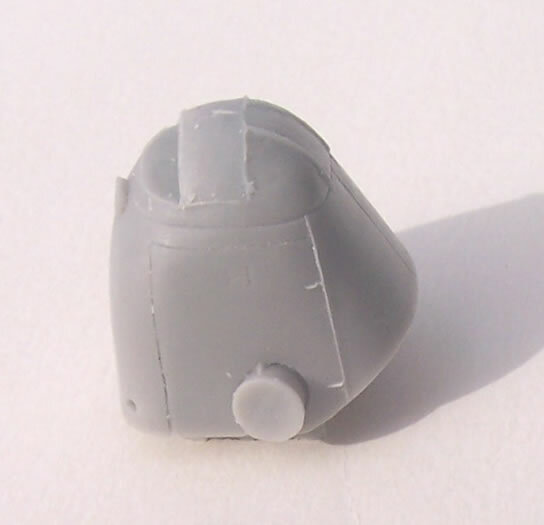 The resin parts are very well mastered and cast, with simple to remove casting blocks. I should explain that my photos reveal some resin dust clinging to parts due to static charge. 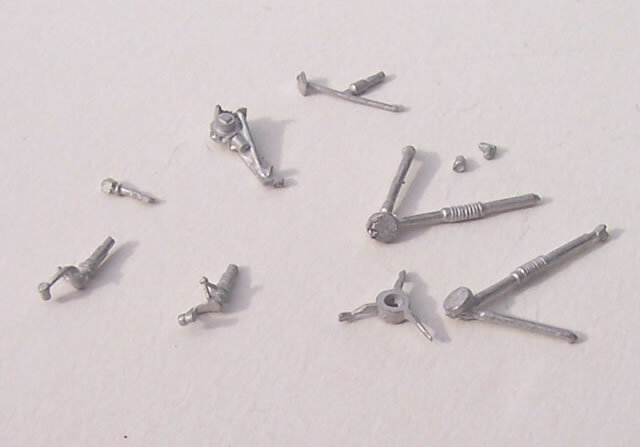 I did not notice these when taking the photos – so please don’t think this detritus is attached to the castings. 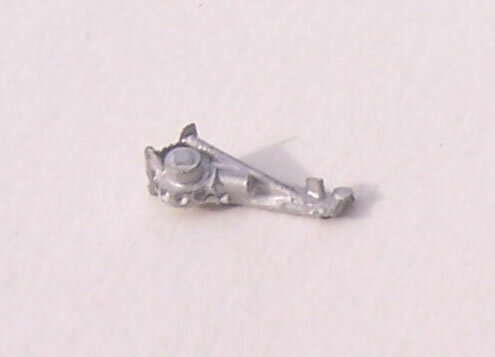 The white metal parts are also cleanly produced, and improve on the kit parts where these are replaced. The PE fret is also finely executed. The decal sheet appears well registered and suggests good opacity. 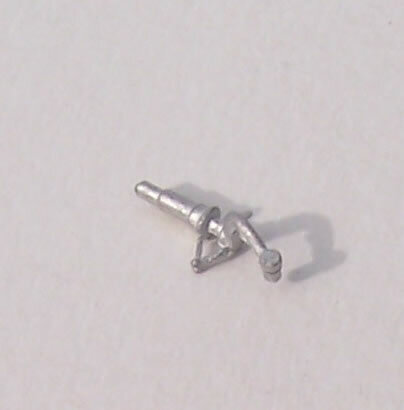 The conversion is intended for any of the Italeri H-19/HOS-4 kits. These have included both straight and cranked tail-boom options, but the conversion set’s inclusion of the cranked tail required for the HAS.9 ensures you can use any of the straight-boomed boxings. I read an on-line post by the set’s pattern maker, Colin Burgess, that the conversion’s tail boom has the lengthened strengthening strake that was a feature of Westland-produced machines. So even if you have an Italeri kit with the cranked boom it would presumably still pay to use the resin alternative. 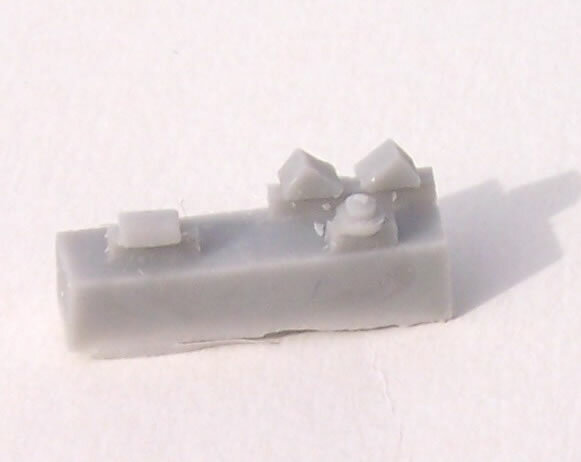 The other two major resin components are the Gnome-powered version’s nose, and the new fuselage underside that incorporates the ASW torpedo trough (left over from the real subject’s conversion from an HAS.7). It goes without saying that some careful cutting and filing will be needed, and the instructions advise care in this area. 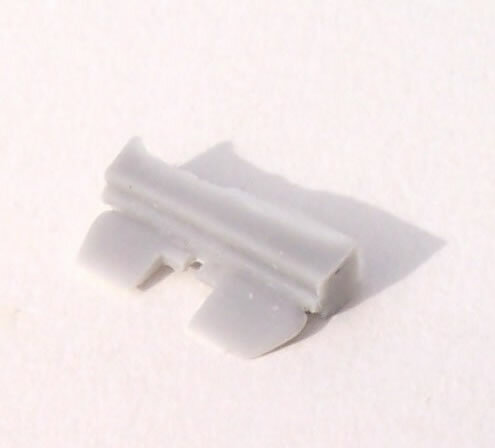 The kit’s nose along the line of the clamshell doors is one cut line, the other being the line of the side-door sill. The tail-boom fits just as the kit parts would. I did notice that the engine exhaust outlet is cast with its cover in place. I understand this is because this is the typical state for the aircraft to be left in on the deck or ground. I can also appreciate that this must have made mastering easier than a thin walled exhaust nozzle. However I feel this is the one slightly disappointing aspect I can see with this conversion. Many modellers complete both helicopter and plane models in ways that do not conform strictly to normal parked aircraft states. I don’t think most jet plane or helicopter builders would be happy if the only option provided in a kit was blanked off intakes and exhausts. I think that an unencumbered open exhaust would have been nice to have, with the blanked off version as an option. I have Italeri’s H-19B Chickasaw kit #1206, and I held the major resin parts against the fuselage parts and a perfect fit looks likely. 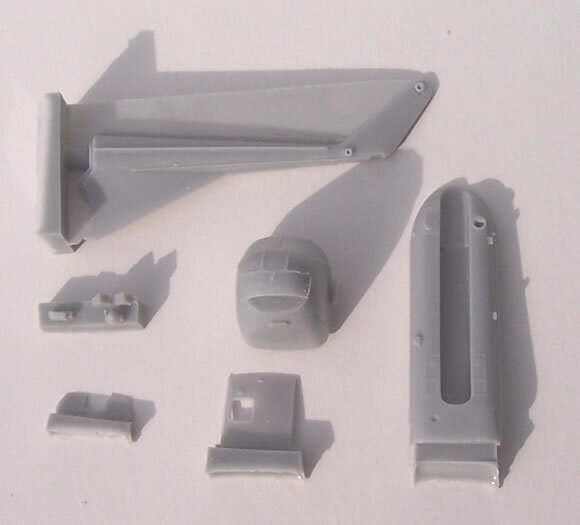 The remaining resin parts are the tail-boom fins, oil filler cap and two wheel chocks. 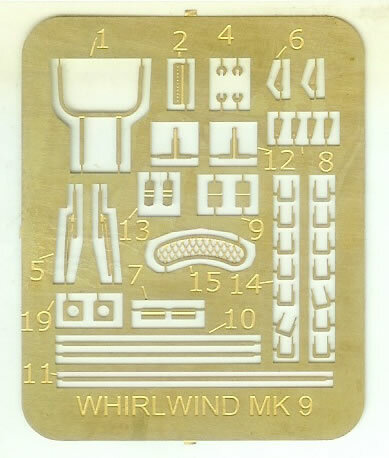 The kit instructions only mention 9 resin parts, the 10th being the starboard sliding door, which is a thoughtful addition. 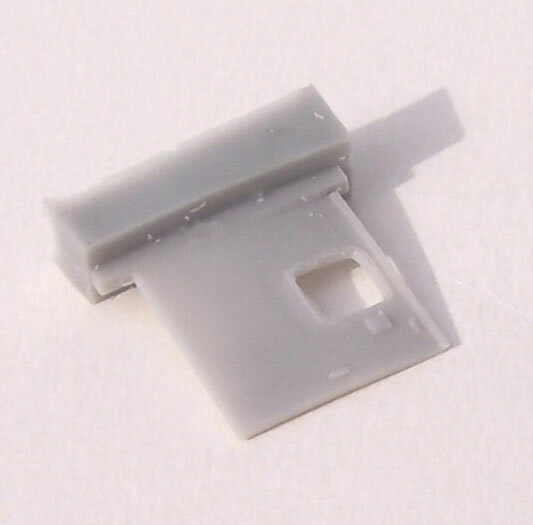 The resin door is an improvement detail-wise on the kit item, although fractionally shorter in height. 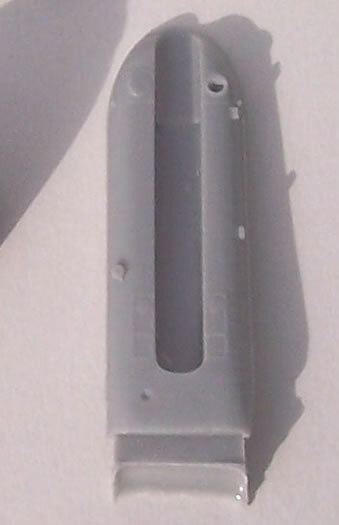 The instructions do mention that the kit’s bottom door rail will be lost after cutting, for which a PE replacement is provided. Although not mentioned in the instructions (unless I missed something), the builder will need to remove the piston-engined version’s cooling grills form both fuselage sides and around the upper nose. Then some panel line scribing using the plans as a guide will be needed. I did wonder why the resin nose did not include more of the fuselage aft of the clamshell hinge-line, to enable the grill areas to be cut away completely. I concluded it was to avoid cutting into the cabin area, as had this been done a solid plug nose would have precluded having the door open. Otherwise a much more difficult to tool and fit thin-walled replacement part would be needed. I think a sensible approach has been adopted in that the easiest cut has been chosen, leaving the passenger cabin intact. No doubt the logic is that anyone who can contemplate such cuts is more than able to remove the grills I mentioned and restore panel lines. The white metal parts include undercarriage legs to support the additional weight of the resin, and I understand that they correctly portray the gaiters over the sliding section. Also they compensate for the kit’s nose legs which are apparently slightly over-length. Again drawing on the set designer’s on-line comments, the later style swash-plate as applicable to the subject’s rotor is provided in white metal. Other white metal items include a tail bumper and rescue winch. The PE fret supplies small details like windscreen wipers, boarding steps, grills, roof rails, tie downs, aerials and so on. XL875 'F' 395, Royal Navy, RNAS Culdrose SAR flight 1970's. This is a very good conversion set that appears to have been thoroughly researched and produced to high standards, but with room for a little improvement in the instructions. It is bound to appeal to RN & RAF helicopter fans, as well as those like myself that simply like something a bit different. I hope modellers show their support for this leading British company so we see more releases of this nature. Need I finish by saying - Highly recommended!